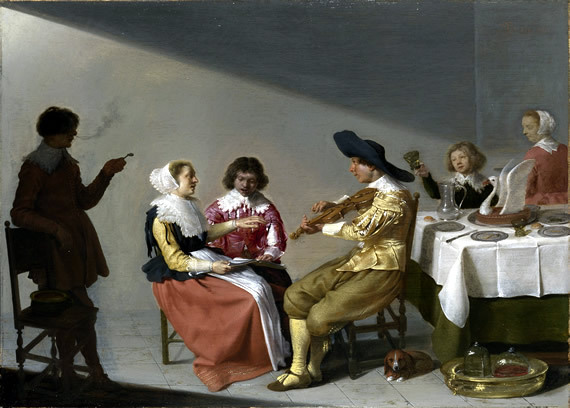 Music in the 17th century – long before sound recordings became possible – could only live in the moment when it was played. Corinna Lotz reviews the Vermeer exhibition at the National Gallery. The 17th century Dutch state in which Johannes Vermeer lived was a most revolutionary place. In an age of absolutism, the seven northern provinces of the Netherlands broke from Spain and declared an independent republic. In the new republic, music and painting were no longer tied to church or monarch. The burghers had a new sense of self-confidence as Dutch fleets developed a global trading empire. But far away from the hustle and bustle of trade and commerce, the atmosphere is calm. And, under the new democratic status quo, there was in all the arts, a descent from the “divine” to the “earthly”. Music was not performed in the new Protestant churches. Nor was there a court with attendant composers and performers. Instead, it flourished in people’s homes. 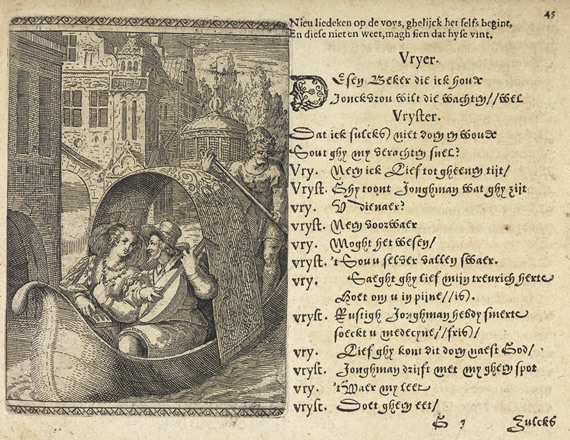 Tiny printed books with lyrics and compositions were used by singers and players. Many of the arts were simply a direct way for people to communicate their intimate feelings and to enjoy themselves. Music was the most ephemeral of all. It only existed in the moment of its performance. Like flowers, soap bubbles and skulls in vanitas paintings and still lives, it was a symbol of transience, of time passing and mortality. So what comes across in the show is a sense of trying to hold on to the present, of love, and of time passing. 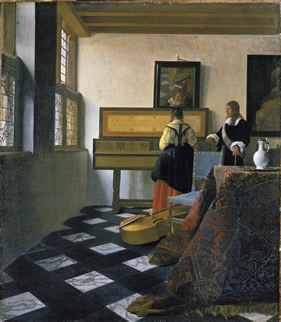 In Vermeer, unlike his contemporaries, everything is reduced to a minimum of elements: a young woman, a musical instrument or two, a richly carpeted table, a painting on the wall, an inlaid marble floor. These are constantly arranged and re-arranged almost like chess pieces. In four out of the five paintings, the woman is alone. It is only in the Music Lesson that a second figure – a gentleman, possibly the teacher – appears. But even there, the virginal player stands with her back to us, focusing on the keyboard, separated from her viewer. A long, lonely space fills the entire lower left quarter of the canvas, so that we are can only approach through progressively receding planes. The shape of the woman’s body, dressed in yellow, blue and red, is subtly echoed by the curves of a white vase poised on a silver tray. 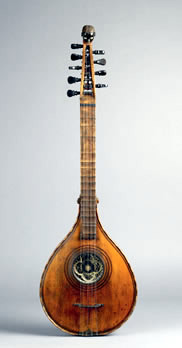 To reach her, we must navigate the fringed folds of the blue, red and gold arabesques woven into the rug, stumble over the viola da gamba. The visual rhyming recurs as the front of the virginal is decorated with more arabesques, a Latin motto on the lid, which says, “Music is the companion of joy, the medicine of sorrow”. This phenomenal composition works into deep space and simultaneously as a flat, geometric play of forms on the picture plane – almost looking forward to Mondrian’s primary colours on black grids. A soft grey light filters through the window panes, casting oblique shadows and enhancing the intense blues, glowing reds and browns. Are there really blacks or are they the deepest of indigos and velvet navy blues? The colours and forms are arranged with an acute sense of organic relationships, held together by the flow of light and space. Although Vermeer’s scenes are from everyday life, unlike many of his contemporaries, they are not “genre” paintings. He infuses the ordinary with a sense of the extraordinary – a quasi-religious moment of epiphany. In the Guitar Player from Kenwood House, painted three years before his death in 1672, Vermeer reduces things still further, zooming in on the young woman in her creamy silk dress and furs, her guitar and a richly framed landscape behind her. A diffuse light falls from a hidden window behind a curtain. This guitar player is not so much an individual young woman as an archetype. She is looking out of the picture towards an unseen listener. It is the absent as much as the present that intrigues. As in the Music Lesson and the Young Woman Standing at a Virginal, rather than the sound of music, we feel the sound of silence. The empty space around these figures emphasises intimacy and quiet, the spatial continuum through which a sound could pass. As with Vermeer’s exact contemporary, the revolutionary philosopher Benedict Spinoza, who lived only a few miles away, we experience a unified cosmos, in which music like thought and feeling, is revealed as an attribute or “property” of a material world of substance. Not since 2001, when the National Gallery shared the epic Vermeer and the Delft School with New York’s Metropolitan Museum of Art, has there been a Vermeer show in London. There are only five of his works here, which will no doubt disappoint those who may have hoped for a grander display. But viewed in the context of the new secular culture, we can appreciate and enjoy them. 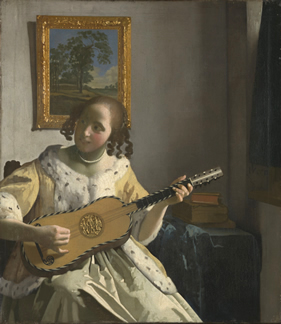 Vermeer and Music is at the National Gallery until 8 September. Open daily. Admission £7. Late openings on Friday. Musicians from the Academy of Ancient Music perform every Thursday, Friday and Saturday in the exhibition space.